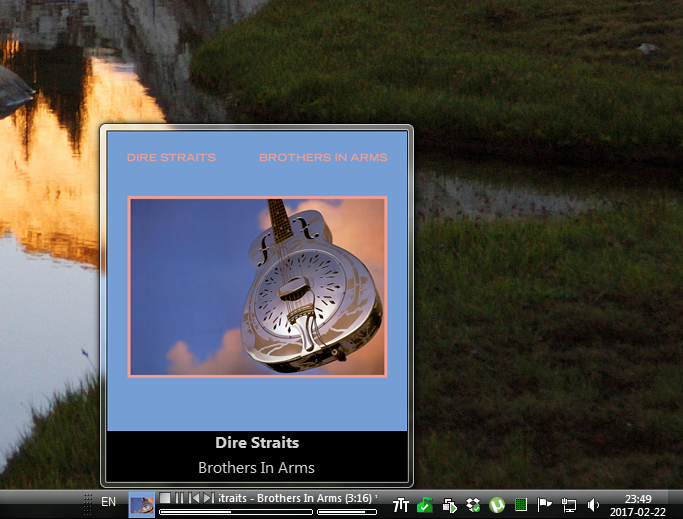 This is foobar2000 Deskband Controls plugin. You can see what it does from screenshot below. Bugreports and suggestions are very welcome. Supported operating systems are Windows 7, Windows 8 and 8.1, Windows 10. 2. Right click this file, select "Properties". In the properties window find "Unblock" checkbox and check it. Click "Ok". Can't seem to get it to work in Windows 7 x64. Tried in the SysWOW64 folder too, no toolbar. I don't think it needs a seek bar but I think it would be nice if it could also show the length of the track. No, what would that have anything do to with it? It doesn't appear under Toolbars. I do have foo_vis_shpeck, which is the same thing. It needs to be recompiled for us x64 users I think. No, what would that have anything do to with it? Dependencies: foo_winamp_spam is required. Also, it works only on Windows 7 (and Vista, I suppose), but I am planning to make it work on XP too. I would love to use such thing like this - Problem is I use another PC to serve music from foobar2000. Any chance such app would work over IP? It would surprise me if it would be required for it to even show up. What that component does is it creates a fake Winamp 1x window that other programs can gather the now playing-info from. And as I wrote, foo_vis_shpeck works the same, so you don't need that specific one. TS can verify it if it's required or not. The problem here is that the control needs to be registered as 32 bit, and it doesn't seem to like the "trick" to use the regsvr32 in the SysWOW64 folder. Yes, you are right. I will try to make x64 version. In current implementation - no. But this is interesting idea, I'll think about it. You mean hide toolbar when user closes player? But than you will have to enable it again manually. I think this must be an option. Just a request for the next version: can you also make a side-by-side version (buttons on the left, track info on the right) for people who use small icons for the taskbar? That would be great! very cool. working great for me in x86. also might be nice also to have a buttons-only version. Thanks. Can I limit it's width? A user defined tagz string would be nice. can you also make a side-by-side version (buttons on the left, track info on the right) for people who use small icons for the taskbar? Minimum width is hardcoded to 200px. It will be configurable in next versions. What do you mean by "tagz"? Is this foobar title formatting tags, like %artist%? Anyway, you can chage string format in foo_winamp_spam settings. I support all the Keesface requests and the pause notification. I think it's possible to hide the controls of the toolbar without closing it, like windows media player toolbar, it would be the more convenient. - Any possibilities to choose which control is showed would be welcome. any updates to this plug-in? hope you haven't given up! If you don't mind, can you also make a version that fits a minimum-sized vertical Windows 7 taskbar? I'm not sure how it's going to look - two lines of buttons plus another line or two for song info should be pretty ugly. But really - play/pause (preferably combined), rewind, fast forward is enough for me and most people and it fits in one line. 1) how can I display only the buttons? I don't want test, title, artist or play status, [stopped], etc. It's not possible in this version, but will be possible in next one. Great! I'll wait the new version! Does it work without Winamp installed too? I haven't installed Winamp and it seems to work correctly. New build is available. Download it here. Please uninstall previous version before installing this one. More details in readme.txt file. - does not work on 64 bit systems yet. P.S. Can I edit my first post here? Nice, thanks. I managed to install it in one go and it works fine, but would it be possible to put this in an installer instead of having to do it manually? I guess that would improve usability. With an autohide when foobar is not loaded (only show one button to launch foobar) I would definitively use it. I have found that explorer crashes if you change the .ini file then remove the toolbar from the taskbar. You have to remove it first then change the .ini. This is on XP. Something I would really like is a stop after current indicator, would that be possible?